Hearts to the Rescue: *Orlando, FL: Savannah on her own walking 100 miles - Urgent!!! *Orlando, FL: Savannah on her own walking 100 miles - Urgent!!! 12-16-13 Savannah is safe with her owner who had been looking for her! This is Savannah and hers is quite a story - she needs help NOW! Orlando, FL - Dog walked 100 miles alone, owner in jail, she needs foster/home/rescue now!! 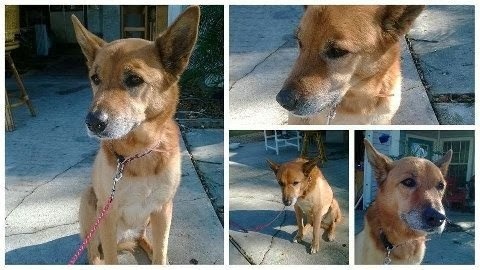 - Savannah, senior Shep mix!! Please contact Chucky ASAP at: 407-739-2003!! This poor girl needs a HOME to love her-=- she's precious just wants some TLC and love, that's IT! If not a home, pls a rescue step up to help her ASAP!!! She was found in my front yard on Black Friday. I took her to my vet and they found she was micro-chipped… Unfortunately, her owner never registered info on the micro-chip. I was able to get the manufacturers number from the chip, and learned it was installed at The Marion County Animal Shelter (Ocala) in 2002. I also was able to get her owners name and address. I did a small background report, trying to find a working phone number for her owner, but had no luck. I was able to get in touch with her owners’ parents, who are in their 90s. Sadly, they haven’t heard from their daughter in years, and said they have no idea of how to find her. I then had my mother help me out; she works for the City, and was able to pull a full background report… That is when we discovered that Savannah’s owner has been in jail since late October. Based on the timeline and geographic scenario, this 11 year old girl has been surviving on her own for over a month, and has walked close to 100 miles. I am an animal lover, and would love to be able to keep this sweet girl, but my family and I are not in a financial position to keep her at this time. I also believe that our home is a little too chaotic for her; between my other 2 dogs (weighing in at 150 lbs combined), and my rambunctious 2 year old… I just don’t think she can get comfortable, or that she is getting the one on one love and attention that she deserves. I have called 15+ rescues, and all have explained to me that they are either full, or that they only accept dogs off of death row. I have also called no-kill shelters in Orange, Seminole, Brevard, Lake, and Marion counties to see if I can drop her off there. I have been told that they do not accept strays, and can only take her if I claim her as a pet. Claiming her as a pet would mean that I am claiming ownership of her for the past 90 days, and therefore taking responsibility for her current condition. Since her current condition is less than fair (due to her extreme weigh loss), I could be fined and charge with animal neglect and have my other 2 dogs taken away. All the shelters I have call have suggested forfeiting her to animal control. I really do not want to send her to animal control because their policy is to euthanize after 5 days. Additionally, I have called them and been informed that they have shortened their holding period to 3 days before euthanizing them, due to the large amount of animals they receive throughout the holiday months. My goal in all of this is to find Savannah a loving and stable home. I feel she would be best suited with either a person who is single, an old couple, or possibly someone with a disability. She is very low maintenance, and prefers to be in a low-stress environment. If you are interested in helping this sweet girl out, or know anyone who may be, Please contact me ASAP at: 407-739-2003. Thanks so much for all of your help and prayers for a forever home for Savannah.